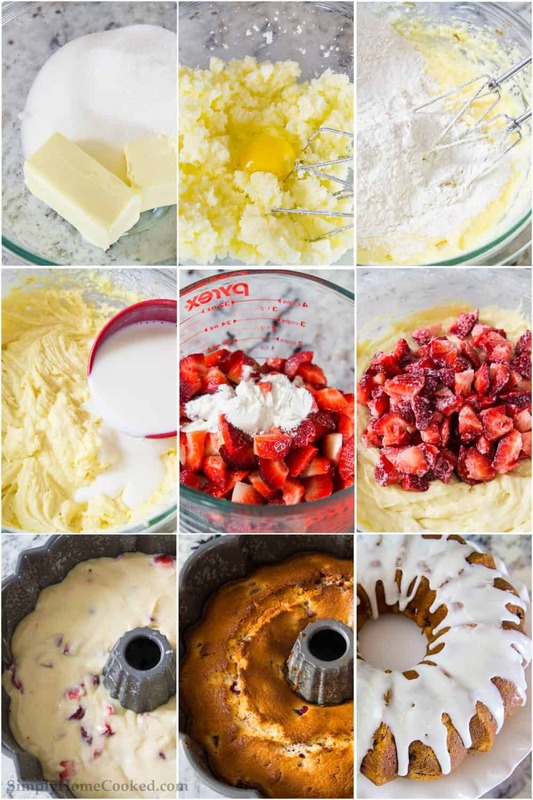 Make this Homemade Strawberry Bundt Cake Recipe as a beautiful and delicious treat everyone at the table will love. This recipe is ideal for a special event or every day treats. Use some of your extra strawberries to make this kid-friendly Strawberry Pineapple Popsicle! This recipe was originally posted March 28, 2016, we’ve tweaked it a bit since then. This post may contain affiliate links. Read my disclosure policy here. Spring is in the air! Everything is starting to blossom and it smells so wonderful outside. 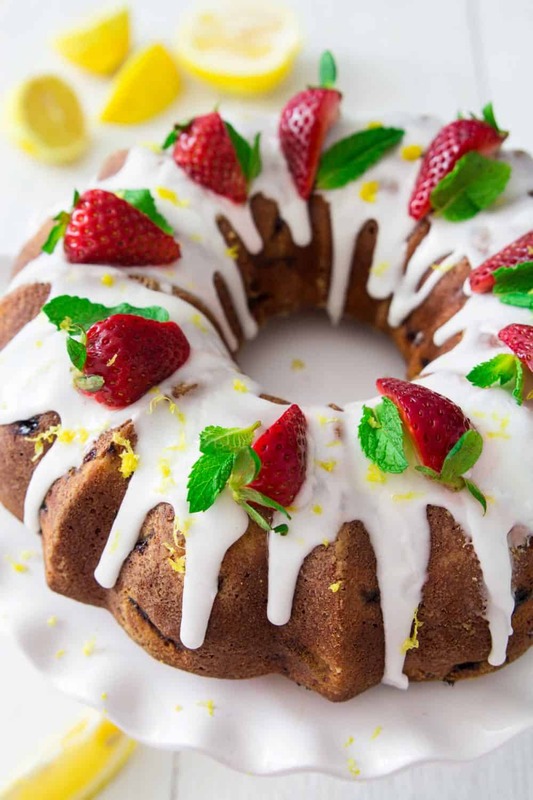 This strawberry bundt cake fits the theme perfectly. 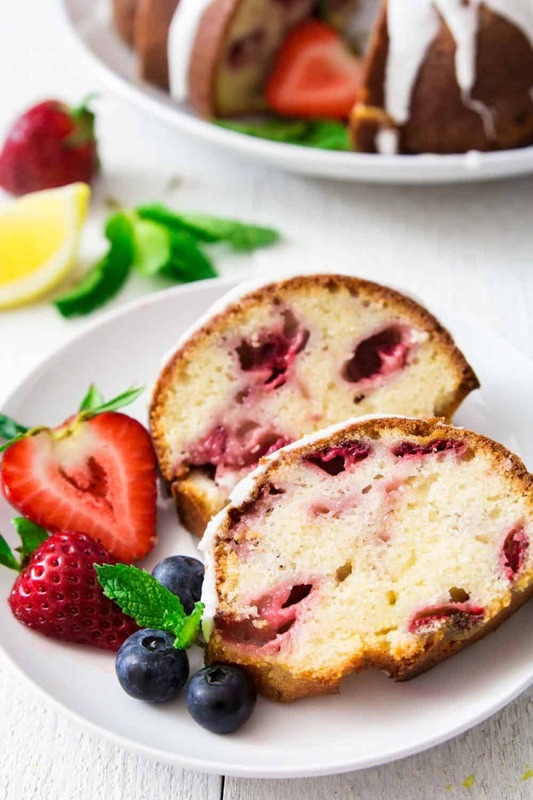 The cake is very moist and packed with fresh strawberries. It’s also very easy to put together. The best part is that it doesn’t need to be served warm, so it can easily be made in advance. Huge thank you to Fred Meyer Stores for sponsoring this recipe. Begin with combing your wet ingredients together using a stand mixer or electric mixer. Next, you will sift your dry ingredients together before combining as directed in the printable recipe below. You will prepare a bundt pan and preheat your oven prior to pouring the batter into the pan and baking. Top with a homemade glaze and additional fresh berries before serving. Making this homemade strawberry bundt cake will make you feel like a pastry chef in your own home. This simple recipe truly is easy to make and gives you the perfect cake for serving guests. If you are looking for more ideas for delicious homemade cakes, check out my favorites linked below. Combine butter and sugar with a hand held mixer. Blend the eggs into the butter (1 egg at a time). Add vanilla, lemon juice, and lemon zest to the batter. Mix just to combine. Sift 2 1/2 cups flour, baking powder, and salt into a separate bowl. Add a little bit of the sifted flour to the batter (about 1/2 cup at time). Then a little bit of buttermilk. Keep switching flour, then buttermilk, mixing in between. 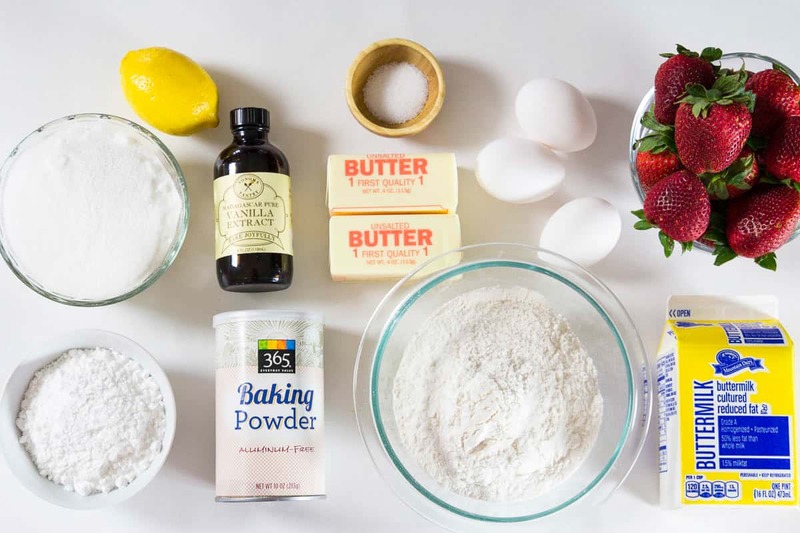 Combine 1 tbsp flour with the chopped strawberries. Then fold the strawberries into the batter using a spatula. Pour the bather into a greased bundt cake pan. Bake at 340 degrees Fahrenheit for 1 hour (or until a tooth pick comes out clean after piercing the center of the cake). Once it's baked, remove the cake from the bundt pan and let it cool on a cooling rack. Combine the powdered sugar with 1 tbsp milk and 1 tsp lemon juice. Pour this glaze over the cooled bundt cake. Top with fresh strawberries. 2nd time trying this. Sticks to pan both times. Suggestions? Tastes great BTW. Hi Sharon, I’m glad the strawberry bunt cake tastes good 🙂 Sometimes an extra generous coating of nonstick spray helps release the cake better. I made this today for our Strawberry Festival and can not begin to say how wonderfully it turned out… moist and delicious!! I am so happy to have found this awesome recipe! Thank you! I am using the Bob Red Mill Fine pastry flour for cake’s and Cookies. so far looking good. If i dont have a bundt cake pan can i divide this between two banana bread pans? Hi Valentina, it depends on how large your loaf pans are. It should fit between 2 (9×5) inch loaf pans. This was the best tasting bundy cake we ever tasted! The flavors are so rich and the cake itself is very most and not too sweet. It is definitely a keeper!